In past years, New York’s Armory Art Show — the annual scrum where 200 galleries gather annually to sell their paintings, sculpture, and artistic whatnot — has traditionally found famous artists established, emerging and dead, dotting the aisles. Andy Warhol and his ilk were everywhere, whether in pricey paintings or cheaper prints. But this year’s event (which opened to the public Thursday at Piers 92 and 94) felt different, more unpredictable: It’s a year without Warhol. With no consensus as to who mattered in late twentieth-century art, and no movement-of-this-century to stick a label on yet, galleries brought some new names and a welcome air of experimentation filled the space. At the busy site of Sean Kelly Gallery, “We did a younger booth than we’ve ever done, to make sure our audience is aware of” these artists, said Lauren Kelly; she added that it resulted in an “excellent” response. Standouts and sales included Leandro Erlich’s $65,000 ethereal cabinet of glass slides painted to mimic cloud formations. Kehinde Wiley’s painting of two handsome men — larger-than-life and staring full-on at the viewer against a bright, patterned background — sold, too, at six figures. The Pierogi Gallery, a pioneer of the Brooklyn art scene when it opened there eighteen years ago, came with a specific strategy. It’s mingling large works by the gallery’s established artists such as Jonathan Schipper — who in 2007 famously staged a slow-motion car crash of a Camaro into a Firebird — with smaller works by younger artists, explained Pierogi co-founder Joe Arnheim at the VIP opening Wednesday night. (Also at the kickoff event: Collectors Eli and Edye Broad, Donald Marron, Adam Lindemann, and the Rubells; artists Terence Koh, Chuck Close, Marilyn Minter, John Waters; several curators and museum types.) About the only artists to have works on view this week in multiple fair booths are Cindy Sherman and Sarah Sze, who’ll be repping the U.S. at the next Venice Biennale. The Armory Fair (just one of eleven art fairs being held this week in New York) opened amid tension and suspense: The rival British contemporary art fair Frieze is coming to the U.S. in May for the first time, luring some dealers and potential clients to its headquarters on Randall’s Island. Few dealers are opting for the expense of doing both fairs, and collector-magnet Larry Gagosian, who’s never done a fair here, has chosen Frieze. The Armory Show clearly rallied under the threat of this new competition. The fair has been much criticized in the past for a corporate feel and a poor, exhausting long aisle-by-aisle layout, but this year there are more lounges, more cul-de-sacs, more cafés. “It’s less torture,” noted one woman in Leo Koenig’s booth. In the weeks leading up to the event, Armory Show director Paul Morris had promised “very significant changes,” including better food and better lounging spaces to encourage longer visits, and he declared that visitors will “never have to walk very far to get some food.” He knows his clientele, a wealthy group of people who’d cross the Alps — and do — for a free espresso and spicy tuna roll. The changes largely worked. But the mood at Armory is good this year. 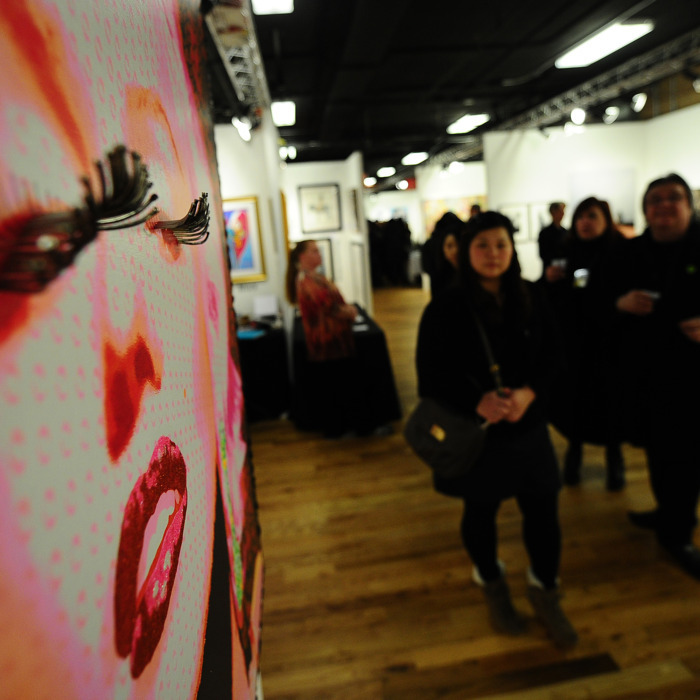 At Wednesday’s art-world-celeb-studded VIP night, Koh noted, “It’s a happy energy, and it’s not just the weather. People are enjoying themselves again.” The Broads, who are among of the world’s biggest contemporary art collectors, said they bought a Cindy Sherman “Murder Mystery” collage series from Metro Pictures Gallery at another of the art fairs and were still shopping at the Piers when we caught up to them. This year’s Armory Show is “more organized,” said Mr. Broad. Added Gagosian Gallery director John Good, “It’s grown-up,” this year. Sales so far: Blockbuster purchases at David Zwirner. His silkscreen posters by Frankfurt artist Michael Riedel sold out at about $50,000 a pop almost immediately. (Among other works, Riedel is famous for “Neo,” his show of photographs of the paintings by fellow Zwirner artist Neo Rauch.) Ragnar Kjartansson’s “Scandinavian Pain,” an acid-pink sign on exhibit from an Icelandic gallery, has also already sold. Berlin’s Spruth Magers also sold several works, including a Sherman, while business was brisk at Marlborough Gallery, and Edward Tyler Nahem made several sales of new work from Andres Serrano’s “Anarchy” series; the artist also stopped by the fair. The Paul Kasmin Gallery brought work by a dozen artists, including Nir Hod’s “The Night You Left,” an oil-on-mirror work, and by Saint Clair Cemin, whose “Father,” a sculpture of a giant shoe in a cage, was among the most striking works at the fair. Kasmin’s gallery will have a major show of Cemin works this fall, the dealer explained. Overall, there is no recession evident in at least some echelons of the art world. In the booth of leading Los Angeles dealer Marc Selwyn, collectors were so bummed he’d sold his Carl Andre — among other pieces — earlier in the day that they sputtered as if it was careless of him not to have brought more. Given the “happy” mood, maybe, it was.